If popularity were a score between one and ten, Charlie Drinkwater would be a zero. He's nerdy and unathletic, and to top it all off, he's suddenly morphed into a giant mutant sea creature sometime between first-period science class and third-period English. Now Charlie's two best friends are treating him like a science project, there's a petition to get him kicked out of school, the cool kids are recruiting him for their clique, and for some reason his parents are acting like everything is perfectly normal. 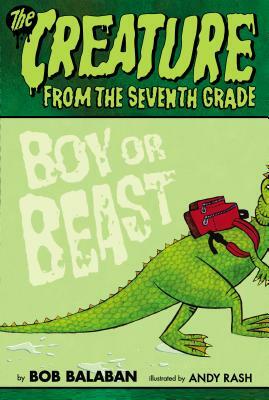 What's a slimy, scaly, seventh-grade creature to do? Bob Balaban is the author of the McGrowl series and the Creature from the Seventh Grade series. He has appeared in nearly one hundred movies, including Midnight Cowboy, Close Encounters of the Third Kind, Waiting for Guffman, and Moonrise Kingdom. He has been nominated for an Oscar, a Tony, four Emmys, a Producers Guild Award, two Directors Guild Awards, and two Screen Actors Guild Awards, one of which he won for his appearance in Gosford Park, a film he also produced. A Chicago native, Bob now lives in Bridgehampton, NY.